A kit of two halves. One half is a stand alone parcels office complete with platform and canopy with a seperate covered ramp building for use on the road side of the building. The other half of this kit is a set of waiting rooms, again with platform and canopies. 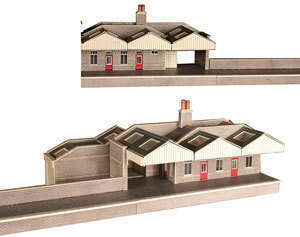 These kit can combine with the mainline station building (PN130) or face it on the other side of the tracks. The choice is yours. Office/waiting rooms (120mm x 56mm 4 3/4" x 2 1/4") each. Ramp building (28mm x 75mm).